We recently went from making cookies three times a week to just once a week and I've been playing around with coconut flour, inventing my own recipes since we are going grain-free. I am really liking baking with coconut flour so far, even better than wheat flour! I think it adds a depth of flavor that is very unique. While playing around with a recipe, I surprised myself with these fudge-like decadent cookies. They have a melt-in-your-mouth consistency. They aren't overly sweet since we are trying to really minimize our sugar intake. You can certainly double the amount of sugar and honey if you like things sweet, but we like the really mild sweetness of these cookies. 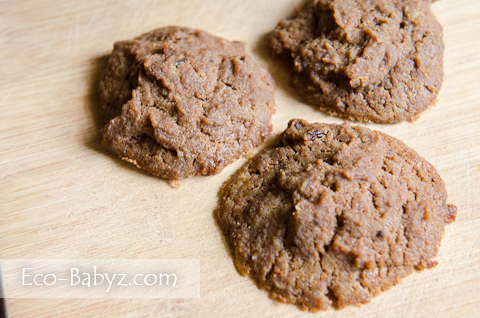 This recipe is derived from my oatmeal raisin cookie recipe. Basically I cut the flour by 2.5 times and almost doubled the eggs in order for this to work with coconut flour. I omitted the oatmeal and instead added cocoa powder to make them chocolaty. I decided to keep the raisins because they go well with the no-too-sweet cookies. You could certainly do without them, raisins are loaded with sugar! If you need a dairy free recipe, you can easily swap the butter for coconut oil. If the cookies come out too dry for your taste, add a little bit of yogurt to the recipe next time, about 1/4 to 1/2 cup should be enough. 2. Melt butter in a small saucepan on low heat. Place first 3 ingredients in a bowl and mix with melted butter in a stand mixer (I love my vintage KitchenAid). 3. Add eggs and vanilla, mix. Gradually add coconut flour, cocoa powder, and baking soda. Mix well. Add raisins, mix. 4. Place round balls of dough about 1.5 inches apart on a cookie sheet. Bake at 350 degrees for 14 to 18 minutes (depending on your oven). 5. Serve with some fresh grass fed milk or herbal tea! these sound and look delish!! These cookies looke awesome. Not to hard to make either looks like. I'm always looking for new cookie recipes. These look really good and easy to make. We just started using coconut flour and this sounds good, thank you for sharing! Id love to try these. Ive never heard of coconut flour so Id like to give it a try. these sound so good. It's amazing how many options there are out there for flour and different varieties. I've never heard of coconut flour, but now am interested in baking with it. These cookies sound yummy!